Ravenna, a city in the province of Emilia-Romagna, was one of those pleasant surprises that we might not have discovered if it wasn’t for our UNESCO goal. In fact, I will admit that I went in thinking that I was only there to check off another destination from our list and instead, it ended up being my favorite part about our week in the Emilia-Romagna. In Ravenna, there are eight places all collectively inscribed under the UNESCO World Heritage Site list as “Early Christian Monuments of Ravenna”. One thing we’ve learned about Italian UNESCO sites is that the list of 50 is very misleading because some of the inscriptions include more than one location. I didn’t think we’d be able to see all eight sights in one day, but luckily for us, they were mostly within a short walk of each other. Only two of the places were a little bit outside of the city center, but since we had our car, it wasn’t a problem for us. 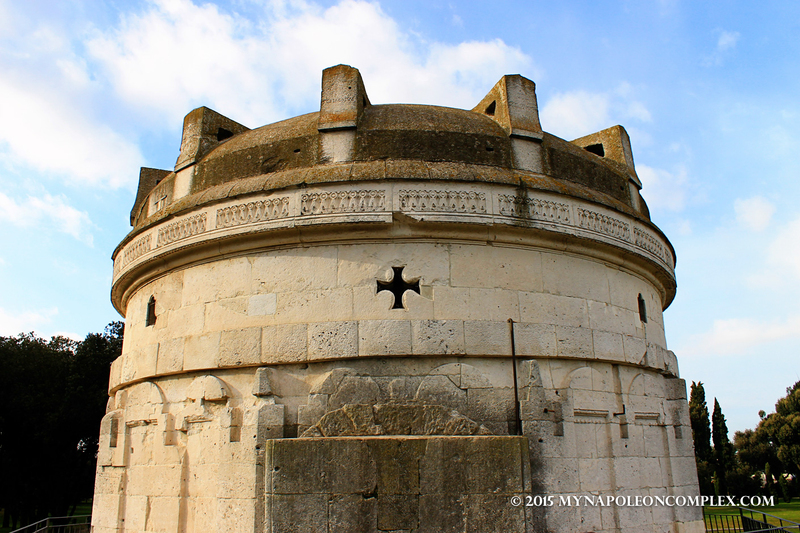 The Mausoleum of Theodoric was built in 520 AD with the purpose of being the tomb of Theodoric the Great (king of the ostrogoths, if that means anything to you). 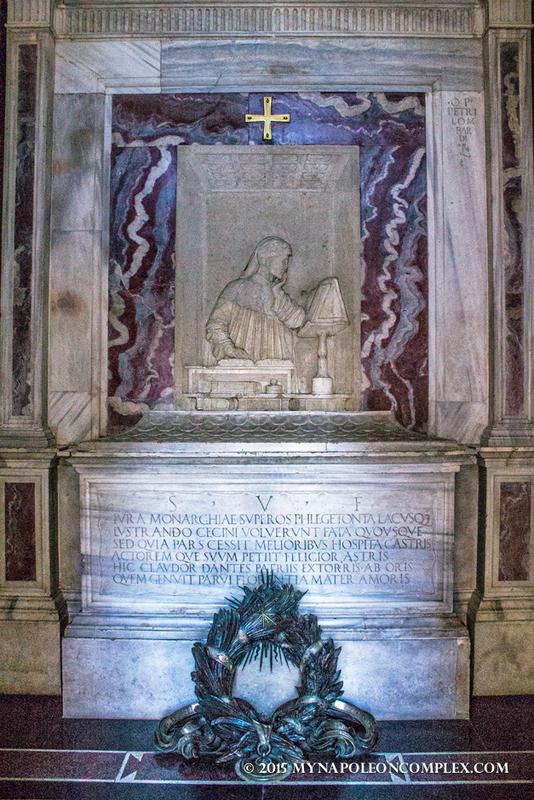 He was eventually buried there, but his remains were removed when the mausoleum became a Christian oratory. It is the only example of a tomb of a king of this period. I’ll be honest, it was really nothing special. It would certainly not be worth the entrance fee if it wasn’t for the fact that the ticket allows you to visit the National Museum and another of the eight sights, the Basilica of Sant’Apollinare in Classe. The Basilica of Sant’ Apollinare in Classe is the other of the two sights outside the city center (the other being the Mausoleum). Unlike the Mausoleum, however, the basilica is totally worth the small trek to see it. It was my favorite of the eight. 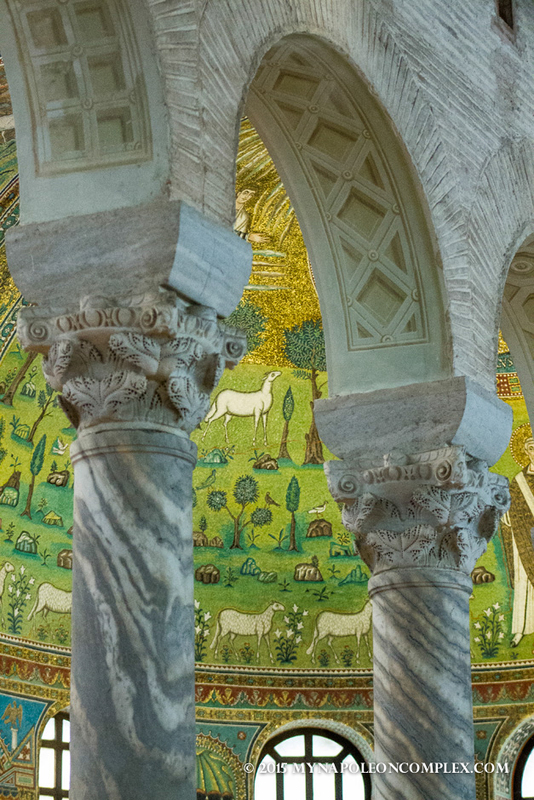 Inside the church, the apse is decorated with a gorgeous mosaic (Ravenna is famous for its mosaics). The mosaic is very symbolic, with the center medallion at the top representing Christ, surrounded by the symbols of the four evangelists. The twelve lambs below the cross represent the twelve apostles, withe St. Apollinaris (first bishop of Ravenna) in the center. Above the cross, amongst the clouds, you can see the hand of God, which I thought was pretty cool. The Baptistry of Neon is the oldest monument in the city, erected at the end of the 4th century. The octagonal building was finished in the 5th century, and also has a beautiful mosaic in the ceiling depicting John baptizing Jesus. The Arian Baptistry is of similar shape to the Baptistry of Neon, but it was built by King Theodoric the Great between the end of the 5th century and the beginning of the 6th century. This baptistry also has a mosaic depicting the baptism of Jesus. This was the smallest of the eight sites, contained within the Bishop’s palace which is also a small museum today. Its significance lies in the fact that it is the only early Christian private oratory in existence today. Unfortunately, we weren’t allowed to take pictures inside. This church was consecrated in 504 AD to “Christ the Redeemer”, but it was renamed twice since then. The first time it was reconsecrated under the name of Saint Martin in Golden Heaven and the second time, in 856 AD when the relics of St. Apollinaris were transferred there from the Basilica of Sant’ Apollinare in Classe. The two basilicas are definitely the stars of this town, as they were simply beautiful. Sant’ Apollinare Nuovo also has mosaics all along the nave, depicting Jesus’ miracles and parables on the left and the Passion on the right. This is the right side of the nave. At the very top, the tiny pictures are scenes from the Passion, while the robed men above the arches are 26 martyrs. The light side of the nave has a procession of 22 virgins. The Basilica of San Vitale is also a must-see, with the largest and best-preserved Byzantine mosaics outside of Constantinople. The mosaics depict the usual scenes from the Bible, along with Jesus and the twelve apostles. Here, you can see the juxtaposition of the rich and colorful mosaic art, with the darker frescoes of the rest of the church. Apart from these eight locations that make up the UNESCO site of Ravenna, another thing of importance is the tomb of Dante Alighieri. Although he also has a funerary monument in Florence, in the Basilica of Santa Croce, his remains are actually buried in Ravenna. Ravenna has repeatedly denied moving the remains back to Florence. Although not shown in the picture, the lamp hanging from the ceiling burns olive oil from the Tuscan hills, donated by the municipality of Florence every September. that seems to mourn the dying of the day.